Two Lift Elevator Banks are low capacity layouts used in buildings with limited occupancy loads. Based on a range of conditions including the type of project, occupancy load, and desired wait times, Two Lift Elevator Banks should be used for offices with floor areas around 90,000 ft2 | 8,361 m2, hotels with 150 rooms, and housing projects with 180 units. Combining a single row of lifts and an adjacent waiting area with a clearance width of 10’ | 3 m, or 1.5x car depth, Two Lift Elevator Banks have typical widths of 18’ | 5.5 m and depths of 18’6” | 5.6 m. Two Lift Elevator Banks have overall areas around 333 ft2 | 31 m2. How big is a Two Lift Elevator Bank? 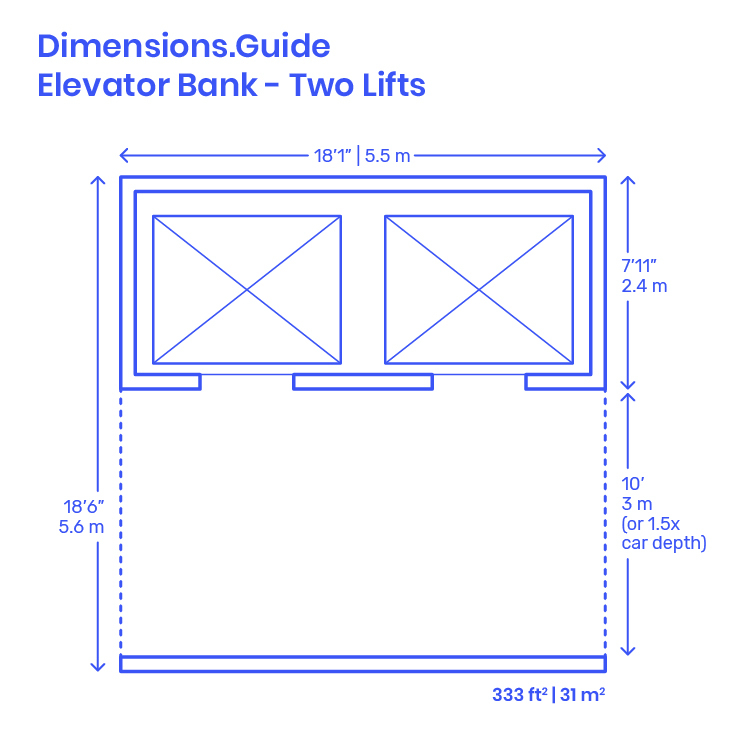 Two Lift Elevator Banks have typical overall areas around 333 ft2 | 31 m2. Connecting a bar of lifts to a waiting area, Two Lift Elevator Banks have common widths of 18’ | 5.5 m and overall depths of 18’6” | 5.6 m.
How much waiting clearance should be provided for a Two Lift Elevator Bank? Two Lift Elevator Banks should have a waiting area clearance width of around 10’ | 3 m, or 1.5x car depth. When is a Two Lift Elevator Bank required? Two Lift Elevator Banks are required to satisfy the relevant project condition: 90,000 ft2 | 8,361 m2 floor area (office), 150 rooms (hotel), or 180 units (housing).